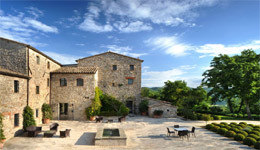 A private estate set in 2,700 acres of Umbrian countryside on the border with Tuscany. Scattered around this unspoilt landscape are 50 farmhouses that have been beautifully interior designed. A 5 star concierge service is available including personal drivers, daily maid service, food delivery and cooking services. Residents can enjoy horse-riding, mountain biking and country walks on the estate. The estate is centrally placed to enjoy the highlights of Umbria and Tuscany and is only 20 minutes from Cortona or half an hour from the galleries, churches, opera, film and jazz festivals or theatres in Umbria's capital city, Perugia. 8 rental villas on nearly 2,700 acres estate. All with private pool and all mod cons. The estate is centrally placed to enjoy the highlights of Umbria and Tuscany and is only 20 minutes from Cortona or half an hour from the galleries, churches, opera, film and jazz festivals or theatres in Umbria's capital city, Perugia. Florence and Rome are within two hours drive, and Siena, Arezzo, Assisi, Todi and Orvieto are all close by.